Despite being docile, a rough green snake can bite humans, especially when their habitat is disturbed or when they feel threatened in any way. They are non-venomous, which means that they won’t kill the cells or disrupt the blood flow. Nonetheless, when they bite, they can cause deep marks on the skin, which can also result in bleeding. Depending on the severity, you can be in pain. Keep on reading and we’ll tackle some of the best preventive measures. Being arboreal creatures, rough green snakes mostly live in trees and low bushes. They are also common in low grass and dense vegetation, especially when they are near the water. During the cool season, they often hide beneath rocks and debris. They are also excellent swimmers, which is why you can find them even in the water. By knowing where they may hide, you will know the places that you should avoid to minimize the risk of being bitten. Whether you are camping in the forest or trimming plants in the garden, you will never know when you can encounter a rough green snake or any other type of snake. With this, your best line of defense is to be protected. 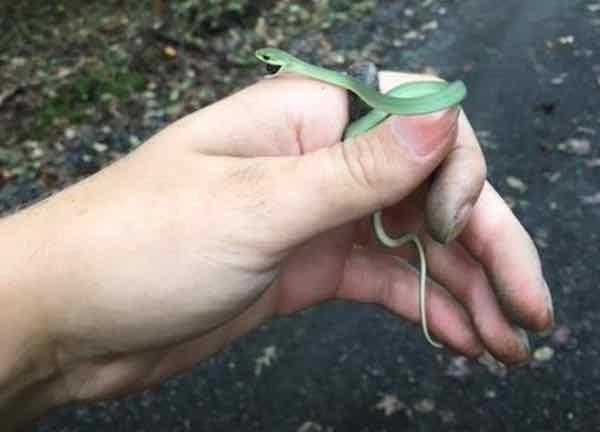 To effectively prevent rough green snake bite, it would be best to wear gloves to protect the hand. To protect the legs and the foot against a rough green snake bite, on the other hand, wearing the right pants and boots will help. No, we are not talking about catching it with your bare hands. Despite not having deadly venom, this is one thing that you should avoid as they still have fangs that can bite you. Instead, you need to trap them. For instance, in the garden, you can use traps that will catch them once they get in contact with it. You can also use a tong or a hook to safely catch the snake and get rid of it, especially if you see it lurking in the backyard of your home. In sum, rough green snakes are gentle and they seldom bite. When they bite, they are non-venomous. Nonetheless, this can still lead to bleeding, pain, and paranoia, especially for someone who is uneducated. Take note of the precautionary measures that have been discussed above if you want to have peace of mind.